After the dramatic events of the past few missions, Captain Saul Harris and Corporal Carrie Welles have found themselves on a path they never expected to be on. Carrie, more vulnerable than she's ever been, is placed under immense pressure as she becomes the most valuable asset to the UNF. Meanwhile, Harris works with the Aurora crew to keep the UNF at bay and shield her from their nemesis, Sharley, who wants her now more than anything. As events unfold, Carrie comes face to face with the truth of her father's past, while Harris is forced to confront the truth of his ancestor's. The revelations leave them reeling in shock, but not as much as when the explosive truth behind UNFASP is finally revealed. You know *that* book where you can just let go because you know it will both melt your heart and jam it up in your throat? Those books where you have such feels you can't see the words on the page when the only thing that matters is to continue reading? 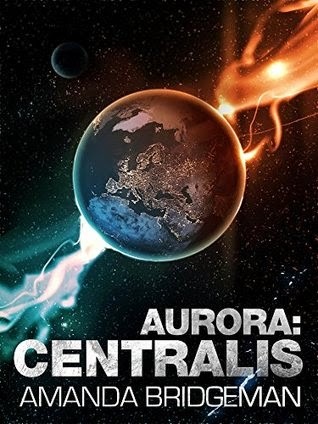 Aurora: Centralis is fourth in Amanda Bridgeman's amazing Sci-Fi series. I enjoy the series' near-Earth story including both Earth-based action and 'local' space action including Mars and the Moon. Placing things in familiar yet futuristic places makes this story feel close to home. For me, Centralis kept me delightfully off balance. After reading all four in a few weeks, getting to know the characters from the previous books and keeping the plot fresh helped me dive right in to this one. I really liked how Welles' and Harris' stories run together and through each other in a way that keeps the tension high. Even during breaks in the action I felt suspense biding its time. Harris and Welles both diverge and converge and many secondary characters stand out, bringing so much depth to the main storyline. Welles continues to face everything but she's not infallible and when she stumbles, it's real and understandable. For Harris, exploring his own gifts, we get to see him expand as a person. His own self discovery doesn't take away from his role as captain and the leader I've grown to respect. No spoilers from me. Just to say I haven't felt so wrung out at the end of a book as I have with this one in a very long time. For me, it's one of those series that will stand out as a game changer when I think about my reading experiences. I received a copy from Netgalley in exchange for my honest review and requested it because I couldn't wait! I'll still buy my own on March 26th.